Winter Storm Warnings and Winter Weather Advisories have been issued for the Philadelphia area ahead of a Major Winter Storm forming off the East coast in effect from 3pm Friday to 6am Saturday. The storm may start as a mix of snow and rain early Friday morning before changing to all rain during the daylight hours. The rain will change back to all snow later in the day, coming down heavy at times with rates of 1-2 inches per hour, and 30-40 mph wind gusts. 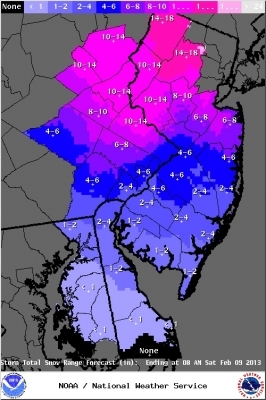 Locations Philadelphia and south could see 2-5 inches of snow. Counties north and east could see 4-10 inches and more of snow. The storm should move Saturday Morning. A 7-year-old boy brought a loaded gun to his West Philadelphia school on Thursday in his backpack. The boy arrived at school at 8 a.m. and put his bag away. When he was switched to his after school program at 3 p.m. he found the gun and told his teacher. “They were notified by a principal that a seven-year-old student who attends the school was in possession of a .38 caliber snubnosed revolver, loaded with five live rounds,” says Southwest Detectives’ Lieutenant John Walker. Authorities continue to investigate the matter, no charges have been filed yet. A man was struck and killed by a SEPTA train this evening near the North Hills station in Glenside, PA. The incident occurred around 6:15 p.m. when an outbound train on the Lansdale/Doylestown Line struck a man in the track area. The line was shutdown until 8:30 pm during rush hour while an investigation was under way.